The Sho Chiku Bai Mon (Pine, Bamboo, Plum Crest) is the basic foundation of study for all Kosho Ryu practitioners, and for that matter, all traditional martial artists. The study of the mon is known as Mon Gaku. The Sho Chiku Bai crest of Kosho Ryu has elements that are over 750 years old. Crests that are developed in modern times do not have the roots and historical significance represented in the Sho Chiku Bai. 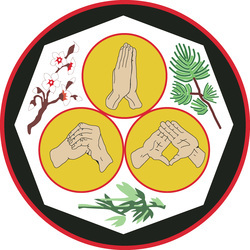 There are three ways of looking at the crest and its meaning. Interpretation is taught in order of importance as follows. The spiritual and philosophical study is most important. This study has a tendency to keep the practitioner in line with his environment and himself in relation to any potential conflict. We must understand that we are responsible for everything we do as human beings. The second representation is that of the physical study. This study deals with avoidance of direct physical conflict with any individual. We can manipulate either body movement or body position so that we may escape harm. This is the highest level of study in Kosho relating to the physical arts: to do no harm. The third representation is the study of destructive arts. These arts are utilized only when there is no alternative. The study of this particular aspect of Kosho Ryu is the most important, and yet the least important. Kosho Ryu is a philosophical art. We must understand that it stems from the study of Zen. Zen Buddhism is the study of who we are in relation to nature, ourselves, those around us, and our environment. The philosophy of Zen is awareness of everything around us and ourselves. Thus, the importance of the study of the Sho Chiku Bai.